7.68 points at 22 votes (rank 153). The main aim at ZOO Mania is to catch animals for the Zoo. For this the player needs to try to place at least three animnals of the same type in a row (vertically or horizontally). As soon as a group of three or bigger gets together, the animals count as captured and new animals come in from the top. In the first level each three animals from different types need to be caught. The number of animals rises from level to level. Thw wohle thing would be relatively easy, if it wasn't for the time factor. If no combination is found, the lower time bar will shrink. This can grow by doing combinations or by a bonus animal. The bonus animals appear in irregular intervals and flash by turns. As soon as the player clicks on it all animals of this type get caught. Smooth scrolling of the coloured sprites, which are animated. Changing and suitable SID music, that top the game off. Highscore saver and trainer mode are built in. Every level has an own intro screen and name. Developer Hannenz has stopped working at the game in 2008. But he has provided the source code of the game as open source for further development. Hannenz himself admitted one bug, that is an unreliable calculation of "No more moves". Although no more moves were possible, the game didn't show a newly compounded screen in some rare but annoying cases. This bug was allegedly fixed in the debugged "Preview 3" version by The Dreams in January 2009. Since October 12th 2011 there is the final version (Zoo Mania Final +3) which should be without bugs (incl. correct demo function). In the available .zip there is the original version, a trainer version and the source code. Since October 20th 2011 you can also find this version for the "EasyFlash" cartridge. (see Links). You play in pairs againt time. You draw in turns with joy #1 and #2 (the cursor changes the colour and by this shows whose turn it is). All the points go to a shared account. You play in pairs against each other and against time. Joy #1 & #2, points go to the corresponding player's account. 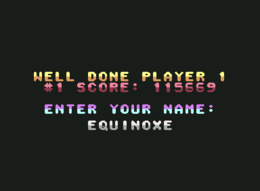 First something about the highscores.... hehe, I know 50000 are hard, but after all this is not a bowl of cherries here, the scores are breakable. I once had about 80000 points - that is no joke. Sometimes you just have to be lucky (the right joker at the right time). If you really want to play for points , my tip: in levels 4-7 (approximately) retard the level skip as long as possible and make points (in the first levels this is not really worth the trouble, as the basis score is only 10), in level 5 this is already 50 and for a row of 4 that you remove in the second instance you get 200 points. Of course you need to strive and just play, play, play until you see blindfolded (what an oxymoron...) where the next move is. For those who find the highscore targets to high: Just delet the file "ZOO.HI" from the disk and then start with highscore saver. 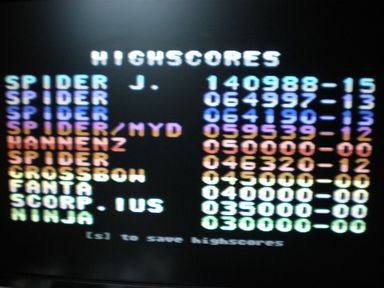 The floppy won't find anything, create an empty highscore list (everything at 0) and save this with the next highscore. (From Preview 2 on this can be done after the start of the game over a query). Only for preview 1: activate trainer mode (press key "F3" in the title screen) and the annoying time bar stands still. Sledgie: "The game is brilliant! Animation, graphics and the game principal are programmed ideally. The motivation stays for long. ZOO Mania gerts from me the best vote of 10". Worf: "Wow, you did really great work there! I would have never thought that this game is so well playable with joystick control. Congratulations! You could only miss the roaring of the animals when the time runs out." TheRyk: "Respect! The layman marvels, the critic wonders. The thing is really done 1 A as a C64 portation. The game is really tricky, on the one hand brains and eyes are challenged properly, on the other hand the time pressure creates action until you despair. Graphical and musical conversion are immaculate, controls are learned fast. I don't know what one could complain about, except that the danger of addiction is extremly high. 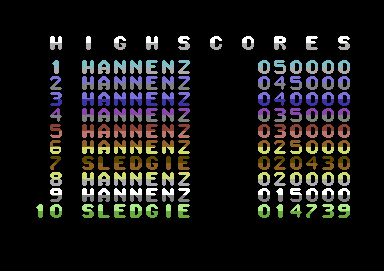 Hannenz and the other participants proof that there are still super game releases for the C64 in the new millenium. The only thing that is left is to give consequently 10 out of 10 points!" 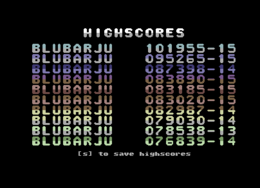 Blubarju: "It is really hard to put the joystick aside, after you've started to play this game. Graphics and sound are also more than good. Therefore full 9 points from me." Zoo Mania was Retro Game of the Week in a UK magazine called "Micro Mart" in issue 1183, page 79, 10-16 November 2011, which is published by Dennis Publishing. No official cover released for this game. This page was last modified on 3 October 2016, at 14:40.